This post is in honor of my dad. He has done quite a bit but somehow it never makes it onto xanga news. We’ve posted many pictures of our house in chaos due to the flooding/re-carpeting episode but lest you think that our house is forever destroyed, I’m here to tell you what a good job dad did in putting it all back together. I’m telling you, it’s pretty neat to have a remodeler for a dad – he can do just about anything. Here is my temporary room (aka Katie’s old room and soon to be Lori’s room when I move out). The carpet is in, the walls painted (a family project) and everything moved back in – decently and in order. 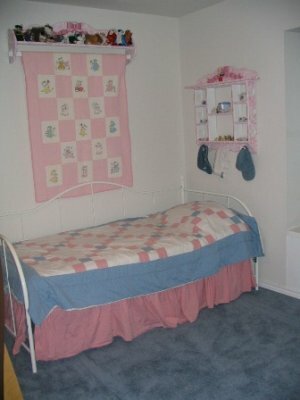 Other rooms fared just as well, if not better. The girls room has totally changed with moving of furniture and faux painting done by Lori and mom. We also have new flooring in the hall installed by Michael and Andrew. So really, the whole family was in on the project but dad’s enthusiasm and knowledge spearheaded the whole event. My dad has also invested into my wedding in ways that are often over looked. He spent several hours one evening grilling 60lbs. of fajita meat while I was at a wedding shower. 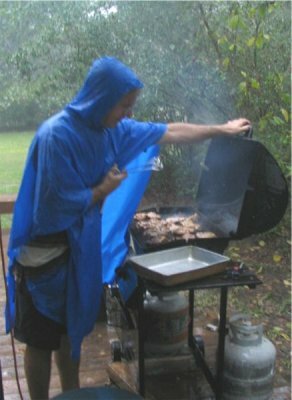 He had foreseen this event and had already prepared for it by getting extra propane for the grill. Dad has also taken over the planning and set up for the wedding and reception. All it took was a few stressed out tears from his daughter and dad was on the job. He has a great ability to envision how things will look and has come up with some neat ideas for layout – I can’t wait to see it set up. Dad also spent all of a Saturday working at the Lassiters, sprucing up the grounds and preparing everything. Again, this Saturday he will spend more time setting up lights and tables. It’s a big pressure off of me, I don’t have to manage anything, I know dad won’t leave anything out. Finally, one of the nest services my dad is providing me is to just take time out and talk with me. He came into my room last night and we talked – some about the wedding, some about life, some about nothing in particular; we were just enjoying each other. One day he spent two hours talking to me and answering questions I had about this new life I’m about to start. He also has given advice to Brian and I but doesn’t pressure us to do things his way, just informs and leaves the choice up to us. So to sum it all up – I have a great dad, I love him very much and I’m sure gonna miss him. My dad just got through grilling 75 lbs. of chicken this evening – quite a feat! But even more so because he did it in the pouring rain! I think he should get a medal or something.